Digital signage is having a significant impact on audiences in a wide variety of venues. But today, that impact is generally delivered one screen at a time. To increase the magnitude of the impact, companies should consider using multiple displays in a coordinated fashion to provide content delivery in a controlled-distribution manner throughout a facility. Since the inception of digital signage, the standard deployment configuration has consisted of a tightly coupled display device and a media player. The media player was, and still is, an ordinary PC running custom software that typically receives instructions and content updates over a network and presents the content on the display device. The display device is typically a flat-panel display, but one that can be deployed using any display technology. The display is connected to the player using a VGA, DVI, HDMI or DisplayPort cable. The use of these AV cables limits the distance between the player and display to a couple of meters, unless an extender is used. This doesn’t create a problem in the tightly coupled model since many vendors provide ultra-small mini ITX form factor PCs that can easily be mounted on the back of the display. Alternatively, vendors like NEC and Samsung offer displays with embedded PCs that simplify installation while reducing cable clutter. The second level of sophistication employs a single PC to drive multiple monitors. As a direct evolution to individual monitors, replicated monitors provide the ability to deliver the same message simultaneously to single monitors distributed throughout a facility. This provides greater ROI on the content investment and number of impressions, but is still often limited to the same content segments delivered in the same manner in the same sequence. Replicated monitors can be configured using splitters or by some media players that include multiple AV outputs. Replicated monitors are a better solution than individually dedicated monitors since they deliver content to multiple locations and reduce total cost since fewer players are needed. But they are still limited to about 2 meters unless extenders are used. Recent innovations provide the ability to dynamically determine which content to deliver to the display from a locally stored library. The decision can be made automatically by various types of sensors, such as Intel’s Audience Impressions Metric suite (formerly Cognovision). Using image processing, these types of systems can determine the approximate age, gender and size of the audience, and use that information to deliver the most appropriate content for that audience. Alternatively, the audience can directly determine the content it views through the use of gesture recognition systems, such as GestureTek or Microsoft Kinect, or touch-screen technology on devices as simple as a tablet PC. This provides a more interactive experience and can enable the audience to navigate to topics of specific interest, but it requires some level of custom integration. Imagine walking down a hall or through a shopping center and seeing display devices spaced every 10 feet. Instead of showing identical content, these displays could be configured to sequentially build on each other, telling a story that develops as you move from display to display or place to place through a facility. The content sequence can be designed to give the targeted audiences a bigger picture as they continue to walk, provided a set of varied reinforcing impressions, or even entice the audience toward a specific destination. The result of this approach can be prolonged content exposure for improved message retention or delivery of the audience to specific locations. Coordinated content like this requires a system that can synchronize content to multiple delivery points distributed over distances beyond the reach of VGA, DVI, HDMI or DisplayPort cables. This can be accomplished through the use of extenders or by delivering command and/or content via a longer distance, readily available infrastructure, such as an IP network. IP has the advantage of being very low cost due to its commodity status. Also, the skills and tools for deployment are readily available and a plethora of products exist to provide a variety of physical and logical routing options. It is important to note that the use of an IP network enables the decoupling of the content from the displays. Instead, with an IP network it is possible to centrally store, coordinate and control content delivery, providing increased flexibility for the design and implementation of the audience experience. A rapidly emerging trend in digital signage is the use of video walls. Once considered too complex and costly for many applications, new breakthrough technologies mean video walls are now practical for a wide variety of uses, including digital signage. Video walls provide the ability to display content in extremely large sizes and resolution by spanning content across a set of “tiled” display devices. In addition, video walls can provide a high level of flexibility for combining multiple content components into a coordinated visual experience. This can include synchronization of multiple simultaneous components, combining components on the fly to provide customized experiences, and using transparency and overlays to dynamically composite multiple components into an integrated message. Today, there are software-based video wall systems, such as Hiperwall, that are hardware agnostic, requiring only ordinary PCs, monitors and a local area network. These software-based systems eliminate the need for complex and expensive pieces of hardware, such as video processors, matrix switches, scalers and extenders, making video walls a practical solution for many applications. These video walls can display still images, pre-recorded videos, and live video and application feeds, giving content designers a high level of flexibility for quickly and efficiently developing and integrating content components into a comprehensive audience experience. The ultimate level of flexibility can be achieved by combing monitor sequences, video walls and control systems into an integrated distributed visualization system. Such a system can easily adapt to the audience, delivering optimal content to the optimal location at the optimal time to influence the audience decision process. This fully integrated system can deliver content to a single point or multiple points with different display technologies, display sizes and display resolutions throughout a facility, including flat-panel monitors, projectors and video walls. Furthermore, the content being displayed at each and every delivery point can be actively controlled by automated sensing systems or audience input. It is even possible to deliver content based on contextual information, making it possible to promote, for example, umbrellas on rainy days or team sportswear on game days. A system with physically dispersed displays also provides the ability to sustain contact with the audience at multiple locations throughout the facility. This sustained contact can be used to deliver reinforcing messages, lead the audience to intended destinations or engage the audience in sustained interactive experiences. The result is a comprehensive visual experience that can reach consumers at all conceivable locations, helping to enhance the overall audience experience. The capabilities described here are best achieved by completely decoupling the media players from the display devices and migrating toward a modular architecture that provides the flexibility to deliver content from any source to any display at any time as controlled by various types of automated and user input. This modular approach makes it easy to integrate new content, control and display technologies as they become available, extending the useful life of existing investments while providing the flexibility to deploy new technologies. Today, many of these technologies are migrating toward an IP infrastructure. Since IP is already well established in the IT world, there is a wide variety of products and tools available to build an IP infrastructure that offers an optimum combination of low cost, deployment flexibility and physical reach. In addition, IP is becoming a standard for many AV applications, enabling a common infrastructure that further reduces costs and enhances interoperability. 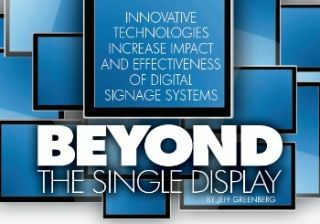 Digital signage started as a single monitor connected to a media player to deliver messaging to a single point of contact. Today’s technology makes it possible to deliver multiple messages throughout a facility or to locations around the world. These messages can be completely pre-programmed or dynamically synthesized by a smart system that combines components on the fly to deliver messaging that is tailored to the specific audience, location, time and context. Successful deployment of these capabilities is enhanced by the use of modular technologies that eliminate the use of tight coupling and rely on an IP infrastructure that can reduce cost, extend reach, and increase interoperability and flexibility.